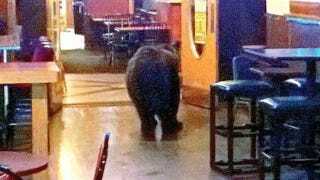 An Estes Park, Colo., bar was recently visited by a curious bear who just wanted to say "What's up?" to the ladies and possibly make a few friends. You know, the usual stuff. Despite arriving in style at 9:15 p.m. (that's when all the cool people arrive), the poor bear's nightlife experience left much to be desired. That's because nobody in the bar even realized he was there! "Nobody even knew it was there," said Lonigans' owner David Callahan. "I just missed seeing it. I was cleaning up and had just taken out the trash." Callahan said his bartender also just missed running into the bear after she had gone to the rear of the saloon. "She just missed it," said Callahan. Daniel Lyell had the sharp eye, spotting the bear while on his way home from work. "I was walking home from work and ran into a bear in the Upper Wiest Lot," Lyell said. "He went from dumpster to dumpster as I stayed a safe distance away. I wanted a photo, and before I knew it, he was headed into Lonigan's. I went in after him and tried to alert the patrons by yelling, 'bear' but no one noticed. I called for the bear when he was just about to enter the middle bar area. He hesitated and then listened to me the second time. He turned around and went out the door behind me." Callahan said the noise from the front of saloon probably kept the patrons from noticing the warning. Are you kidding me, Estes Park bar patrons? This was probably your one chance at befriending a bear, and you totally blew it! I'm sure that loud music you were enjoying was nice, but there's no way it was as much fun as PARTYING WITH A BEAR. Now the bear probably feels excluded and will never come back. Serves you right.